Near by, on a pine tree there hung the most beautiful robe he had ever seen. He knew it belonged to the tennyos, but quietly took it home. She stayed and married the fisherman, and gave birth to many children. back, she returned to the sky leaving behind her children and husband. (I added a little quote that also has to do with the legend. See below.) There are many more versions of this legend, probably more than 60 versions on Japan (wow, that's a lot!) and since many countries believe in celestial beings (angels) there must be similar stories around the globe, so that would be a ton of stories to a same concept. I'll try to get more versions and put them on so we can all have a broader view of the legend that inspired Yu Watase to create Ayashi no Ceres. "Now I have landed at the pine-wood of Mio and am viewing the beauty of the shore. Suddenly there is music in the sky, a rain of flowers, unearthly fragrance wafted on all sides. These are no common things; nor is this beautiful cloak that hangs upon the pine-tree. I come near to it. It is marvelous in form and fragrance. This surely is no common dress. I will take it back with me and show it to the people of my home. It shall be a treasure in my house." In the village of Mio there lived a fisherman named Hakuryo. One day, Hakuryo was enjoying the view of the beach when he saw a beautiful feathered robe called a harogomo draped on a limb of a pine tree. No one was around, so he decided to take the beautiful hagoromo home as a treasure. Then a tennyo, a celestial being or heavenly maiden, appeared and told him that the feathered robe was hers. She begged him to return it to her. Hakuryo, however, had no intention in giving it back to her. She pleaded with the fisherman and told him that without her robe, she could not return to the heavens, and she began to cry. 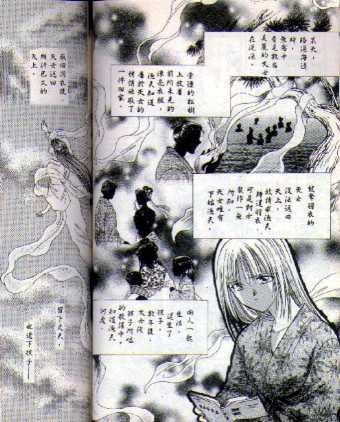 Hakuryo then began to feel sorry for her and told her that if she danced the dance of the heavens for him, then he would return it to her. So she danced for him and then was able to return to the heavens. Once upon a time, there was a young man named Yumihito who lived in what is now known as Higashikawa. One day he went hunting as requested by his father. He didn't really want to because he had had his bow stolen and he because he though he was no good at it, so while walking along the mountain road he came upon a hot spring near a small waterfall. He was tired and decided to bathe in it. Then he heard a young woman crying nearby. He approached her and asked her why she was crying and she told him that she was an angel and that she could'nt return to the sky because her robe had been stolen by some bandit and as he listened to her he felt sorry her and decided to get her robe back. First, he cut trunks of wood and grape vines and took them to the bandit's hideout. When he got there the bandits were eating and drinking and having a great time, then he placed the trunks of the trees on the backs of horses and bound them with the grapevines. This done, he turned loose the horses and as they ran off the bandits thought that the tree trunks were men on horseback and they chased after them.